Once again, it’s been snowing like crazy here on the east coast, and there is nothing more satisfying and delicious after shoveling out your car (for what seems like the bazillionth time this winter) then this Hearty Tuscan Bean Stew from Cook’s Illustrated. I think it’s best when made with kale (pictured here), but a mixture of greens is also great. This is one of those simple, healthy, pretty much foolproof recipes that seems to come out perfect every time (the secret is cooking it in a good, heavy duty dutch oven). If you’re more into soups then stews, just add another cup of chicken broth and 3/4 cup of water when you add the greens. A big bowl of stew, topped with grated Parmesan cheese and served with a toasted piece of crusty garlic bread makes an amazing meal. I also always add a couple of squirts of Sriracha sauce for a little spicy, garlicky kick. Another great thing about this stew is that it freezes perfectly. Just divide it into serving size portions, freeze, and when you get a craving, just pop it into the microwave for a couple of minutes and it tastes as good as the day it was made. 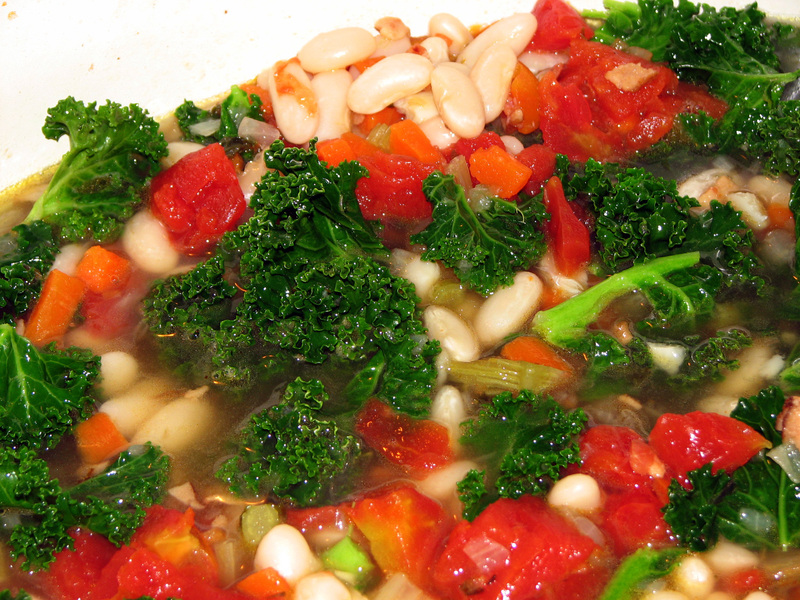 Please click here for a printable copy of the Hearty Tuscan Bean Stew recipe.